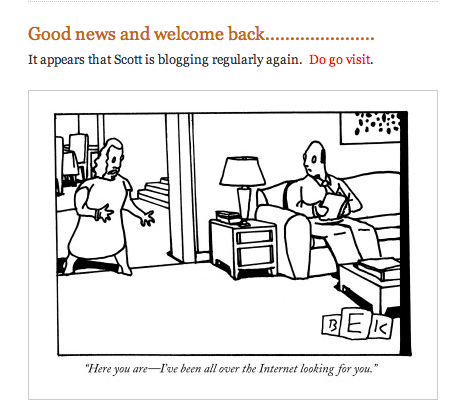 I would be remiss if I didn’t thank Steve Layman over at Anderson Layman’s Blog for acknowledging my return to regular blogging, even with a nice little comic. Steve’s blog is really quite wonderful and I’ve been proud to link to it for a long while as i find the mix of music, comics, commentary and other miscellaneous bits a welcome daily sight in my RSS reader. I admit this caught me off guard as I didn’t expect anyone to have noticed my absence, much less my return.